The environmental conditions that determine the benthic foraminiferal biofacies in the shelf part of Bay of Bengal are identified in the present study. The possible variables such as water depth, nature of sediments and substrate, salinity, dissolved oxygen and hydrodynamic factors are evaluated. A total of 23 surface sediment samples were collected at different water depth from the study area and were subjected to foraminiferal analysis and sediment characterisation. Altogether, 147 species belonging to 59 genera and 6 orders are identified, only 22 species are abundant. Cluster (Q-mode and R-mode) analysis of the abundant species resulted in the identification of four distinct biofacies which are correlated with environmental variables. 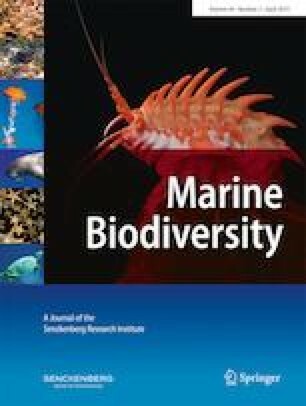 The shallowest biofacies from 0 to 38 m water depth is represented by Ammonia beccarii, Amphistegina radiata, Asterorotalia pulchella and Elphidium crispum, which are associated with sandy sediment. The second biofacies from 38 to 83 m water depth is characterised by Cibicides wuellerstorfi, Quinqueloculina seminula, Quinqueloculina lamarckiana, Quinqueloculina vulgaris, Quinqueloculina agglutinans, Rotalinoides compressiuscula and Textularia agglutinans and the nature of sediments varies from slightly muddy sand to muddy sand. The third middle shelf biofacies from 83 to 150 m water depth is composed of Asterorotalia dentata, Cassidulina laviegata, Cibicides subhaidingerii and Lenticulina thalmani that are found in muddy sand sediment. The fourth outer shelf biofacies consisting chiefly of Bolivina ordinaria, Brizalina spathulata, Bulimina aculeata, Cancris communis, Siphouvigerina proboscidea and Uvigerina parvula exists from the depth of 150–200 m and related to sandy mud sediment. Two Paleo strandlines are identified at the depths of 49 m and 105 m, respectively, from the occurrence of relic forms along with soft coral sclerites. The shallower part of the seafloor up to 30 m depth is dominated by sandy sediments, reflecting the prevalence of high-energy conditions. On the other hand, the deeper part contains sediments with more mud content formed in low-energy conditions. The spatial distribution of benthic foraminifera in this shelf region is chiefly controlled by the nature of sediments and the bathymetry. However, another factor, such as dissolved oxygen, salinity, temperature and hydrodynamic conditions, seems to have an influence on the composition of benthic foraminiferal biofacies. The authors are grateful to the University Grants Commission, New Delhi for providing financialsupport during research work and National Institute of Ocean Technology, Chennai (Ministry ofEarth sciences, Government of India) for sample collection. We thank (NIOT) Vesselmanagement cell Head Mr. D. Rajashekar, Mr. N. Ravi Scientist C and Project scientificassistant Mr. Thiruvathi Babu for their help and support. The authors are thankful to theanonymous reviewers for their valuable comments, which greatly improved this article. Theauthor thank Aravind Bharathvaj Sridharan, PhD Scholar, Dept. of Earth Sciences, andPondicherry University for the technical support in the GIS software analyses.